If you’ve already Captured Wild Yeast and Created Agar Plates, then why not finish the job? Isolating yeast at this point is as simple as taking a very small amount of your culture and rubbing (streaking) it on to an agar plate. Because of the stable, non-liquid agar medium, once streaked, single colonies of microbes are essentially stranded by themselves. After a few days or weeks (depending on incubation temperature and microbe population), they’ll multiply and grow large enough to be seen with the naked eye. At that point, it’s a matter of selecting the colonies you like and growing them up to larger amounts. It’s impossible to stress enough how important cleanliness and sanitation are at this point in the process. If you truly want a pure strain, you need to ensure you’re not contaminating what you’re trying to isolate with other cultures. If you already have a Saccharomyces culture from a yeast lab handy, it’s ideal to practice streaking on a plate with a pure culture. This will help you get an idea of what colonies of brewer’s yeast usually look like. That will be useful when deciding which colonies you want to select when isolating. Turn on your burner. Try to do as much of your work as possible close to this source of heat. It will help keep your work area decontaminated by creating an updraft under which you’ll do your streaking. Remove the plastic wrapping from your agar plate. If you kept it refrigerated upside down, you’ll have some condensation that’s formed on the lid. Keep the dish upside down, remove the lid from the bottom and just quickly tip the lid over and let the water fall out. Put your upside down plate back on the lid. Sterilize your loop (or paper clip) by placing under burner flame until red hot. Make sure you let it cool down for roughly 30 seconds before going to the next step (or by dipping it into some sanitizer), otherwise you’ll caramelize your microbe friends. If your culture was acquired from a Wild Yeast Starter Jar, use a sanitized pipette to pull a sample from the bottom. If your culture is in a centrifuge tube, shake it up to distribute the yeast. Dip the loop into your liquid culture. You only need a very small amount, just enough to get the tip wet (just the tip). While it seems like a small amount, once plated and incubated you’ll have more than enough microbes to work with. Remove the lid from the agar plate. Gently streak a few lines across the outside edge of the agar plate at an angle. There are many techniques for streaking, but I find creating a diamond shape works best for me (watch the video and check out the image below for examples). Sterilize loop under the flame again. This is important because you’ve just put a huge amount of microbes on your plate in that one streak. After this point, you just want to thin out what you already have streaked on the plate. Otherwise you’ll have big globs of microbes everywhere, making it nearly impossible to isolate a colony. Sterilize loop again. Go back to previous streaks and drag across them, creating lines in another direction. Continue repeating this process until you’ve streaked in four different directions on the outside of the plate. If there’s room, do one last set of streaks but this time streaking to the inside of the plate. Be especially careful that you only streak into previously unused space. Flip plate over (agar side up) and place on top of lid. Move to warm, dark area to incubate. This could take only a few days or as long as a couple of weeks depending on how many cells you initially started with and incubation temperature. 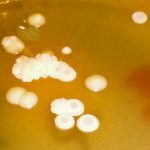 If you used a pure Saccharomyces strain to practice, you should now see a large amount of round, white to off-white colonies of yeast. The first lines that you streaked should be the heaviest in concentration, and the following lines should get progressively less dense until you see single colonies by themselves at the interior of the plate. 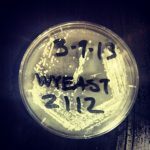 Wild Yeast Culture: Repeat steps 1 through 8. Once the plate has been incubated, you’ll see far more diverse types of colonies growing and possibly mold. Since you want to isolate a wild yeast strain from among several different types of microbes, it’s important you start the next process soon after you see a healthy amount of colonies form on the plate. If you wait too long, some colonies will grow faster than others and will eventually take them over, making it impossible to isolate either of them. Review our Microbe Portrait Gallery to see examples of the most common microbes seen in brewing for colonies with similar morphologies (color, shape of edges, and type of upward growth). If you did a practice streak plate using a pure Saccharomyces strain, compare that as well. To increase the odds of isolating a pure culture, select just one colony to propagate. It’s ideal to select at least a few colonies to increase the genetic diversity of your culture, but without the benefit of a microscope, you won’t know if the colonies you’ve selected are the same. If you want to go this route, you will need to streak another plate using the culture you’ve grown to guarantee a pure strain. Snag a new plate from the fridge and remove ParaFilm. Grab your previously streaked plate. It should be a cornucopia of microbes (including mold). This is ok! Sterilize the loop under your burner. Let it cool for roughly 30 seconds. Look for medium-sized, white to off-white, nicely round, individual colonies. Pick up a small amount from one colony. Restreak a new plate using steps #1-8 from Streaking A Plate section; incubate. Continue picking a single colony, restreaking and incubating plates until you have one where all the colonies growing have the same shape, size and color. Once you’re satisfied that you have a uniform plate of organisms, select one colony from the plate using a sterile loop. Dunk into a vial with 10ml of boiled or sterilized low-gravity wort (1.010-1.020). Seal, and shake vigorously. You now have the world’s smallest yeast starter. The sky is the limit now! Build up to pitchable quantity (10ml to 100ml to 1L) and toss into a test batch of homebrew. Got any questions? 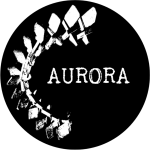 Use the Contact page. You’re ready to capture, plate and isolate your very own local yeast strain! Learn how to also permanently bank your pure culture. 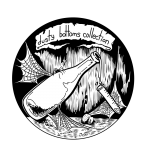 Now be the first person to claim your local yeast code and become a Bootleg Biology Contributor!